We are happy to provide these articles for you to read and only ask you to respect the author's intellectual property and copyright - please ALWAYS quote your sources. Article written by Sheridan Hill - This is a link to her website. The article also appeared in the magazine Lilipo in Summer 2003. 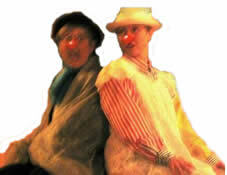 Research proposal for using clowning in the training of language teachers – an account and theoretical examination of the experience of working with Waldorf English language teachers in Germany. Receive as email in Pdf file format. - 17000 words.